In the last week of September 1936 the British Union of Fascists (the BUP) announced its intention to mount a show of strength in the East End of London on the afternoon of Sunday October 4. The aim was to intimidate the local Jewish community and the local anti-Fascist working class. Uniformed Fascists were to gather in military formation on the edge of the East End, to be reviewed by their leader Sir Oswald Mosley before marching through the East End to a mass rally in Victoria Park, Hackney. News of the coming demonstration provoked enormous anger among both Jews and non-Jews in the East End, including the many members, Jewish and non-Jewish, of the British Communist Party. But the Communist Party leadership, under orders from Moscow, had another priority that week. Instead of preparing to confront the British Union of Fascists, the Communist Party urged its members and supporters to attend a Young Communist League rally in solidarity with the Spanish Republic, a rally that was to be held in Trafalgar Square on the same afternoon as the Fascist demonstration in the East End. By Friday October 2 it was clear that the Home Office had no intention of stopping the Mosley march. Only then did the Communist Party cancel the Trafalgar Square demonstration and call for mass opposition to the British Union of Fascists in the East End. Leaflets that had already been widely circulated, advertising the Trafalgar Square event, and calling for all ‘London Workers! Anti-Fascists! Peace-lovers!’ to gather at Temple Station on the Embankment at 2.30 p.m. were hastily overprinted: ‘Alteration! Rally to Aldgate 2 p.m.’. 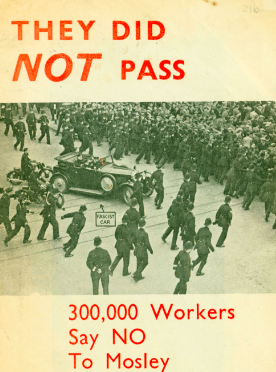 The Independent Labour Party (the ILP) played a prominent part in rallying support for the anti-Fascist march. On Friday, October 2, an ILP meeting at Hackney Town Hall called for ‘an overwhelming demonstration against the Fascist march’. The ILP later announced ‘that it had called to the East End workers to mass in Aldgate in such numbers that the march would be impossible…. For hours at the Head Office duplicated copies of the leaflet were run off, and soon they were being distributed in thousands throughout East London.’ The London evening Star had a front-page headline that read: ‘ILP Call to the Workers’, and printed the ILP’s statement in full. The ‘Battle of Cable Street’ took place on Sunday 4 October 1936. Assembling in Royal Mint Street, near Tower Bridge, and intent on marching through the East End to a triumphal rally in Victoria Park, were five thousand uniformed British Union of Fascist marchers. The marchers were due to gather in Royal Mint Street at 2.30 p.m. ‘Hours beforehand,’ the Daily Worker reported, ‘every street between the Mint and Aldgate was thronged with people.’ The marchers formed up in military formation, a column of three thousand men stretching back for half a mile, with more than two hundred black-bloused women in the centre. Facing them, and seeking to keep them out of the East End, were more than a hundred thousand anti-Fascists: local Jews, socialists, communists, anarchists, Irish dockers, miners from as far away as Wales and the North of England. More than 10,000 police, including 4,000 on horseback, prepared to clear the road so that the marchers could continue unmolested. As the marchers waited for their leader, and for the order to advance, they called out in unison: ‘The Yids, the Yids, we gotta get rid of the Yids’. They also chanted: ‘M-O-S-L-E-Y, we want Mosley’, to which the watching crowd shouted back, ‘So do we – dead or alive’. The marchers advanced along Royal Mint Street, in the direction of Whitechapel Road. They planned to march past Gardiner’s Corner, a department store in Aldgate, at the junction of Commercial Road and Whitechapel Road, known as the ‘Gateway to the East End’, but they did not get that far. A lone tram driver stopped his tram in the middle of the junction, blocking the Blackshirts’ way. The driver then got out and walked off. Barricades were erected in the side streets to stop the marchers advancing. After a series of running battles with the defenders, the Mosleyites failed to break into Cable Street. At that point, Sir Philip Game, the Police Commissioner, fearing serious bloodshed if the marchers continued their assault, ordered Mosley to call off the march. The Blackshirts then dispersed westward towards Hyde Park, while the anti-Fascists continued to battle with the police. In all, 150 of those who had sought to halt the march were arrested, and about a hundred were injured, including police, women and children. Some of the arrested were sentenced to hard labour. The Battle of Cable Street was over. The men and women of the East End, Jews and non-Jews alike, had successfully held off a provocative march through their streets. Uniformed thugs had been repelled. But the efforts of the police to protect those thugs, and the ferocity with which the police acted against the defenders, left a legacy of hostility, and a foreboding that the Fascists could, and would, be allowed to return.